-5 today with wind chill at -30! Schools closed today and Thursday. Also today the US. Mail was cancelled! What's the weather like where your at? Woke up to -29 on the thermometer on my HVAC. Wind-chill had it at -65. I refrained from taking the snowmobile out but only due to work. Going for a rip tomorrow, but I have a few hundred miles on this winter at sub -15f already. I heard those temps today for MN. on the radio! Makes it sound balmy here in Ohio, lol. Do you have heated gear and grips for your sled? Handwarmers and muffs. At those temps you have to do everything. Sleds come stock with warmers, but I yanked the grips/warmers and glued cork to the bars. Put the warmers on top of that and they are turbo charged now. Sort of necessary as I don't have much of a windshield. Could get by without the muffs if there was a big ole windshield, but that is because nothing is more warming than a huge windshield. They don't make one for my sled in particular when you are tall and ride standing. I also put a piece of duct tape over the vents on my Fly Carbon helmet when it is this cold. That isn't necessary for short rides, but I ice up everything on longer ones if I don't. Nice sled. A real sled trip is on my buckets list. Timber sleds too since I am a dirt bike guy at heart. About 20 this morning which is pretty cold for Charlotte. I does get colder but not too often. Wind has been blowing too. No chance that I would complain after hearing what you guys are dealing with. We need some sustained cold here as we have a very bad ant problem that could end with some cold temps for a little while. There are none of these invasive ants 2 hours north of me. Wish I had a sled, woke up to 10 degrees with 6" of fresh powder. Supposed to be 40 tomorrow and near 60 on Monday. I love Ohio weather! Put on 120 hard miles yesterday. Nothing has been groomed here in the cities yet and that means that ANY trail crossing a corn field is unrideable as the farmers flip the soil from more than 2' down. Makes huge frozen chunks that are unfun to ride on. It was cold as hell and windy which meant the ditches were full of odd shaped, rock hard drifts. Lots of places for air, but the landings were not always fun. Here is some props as well for modern clothing. We stopped at a watering hole for some chicken wings and when I took off my shell, my polartec layer was covered with ice. It was all sweat that had frozen, yet I was completely warm. My "cold weather" gear consists of a merino wool shirt, a polartec mid-layer and an eVent shell. Everything was completely saturated with sweat when I got home, but even at below -10F I was never once cold anywhere. Ugh. Popped the motor on my 2016 this weekend. 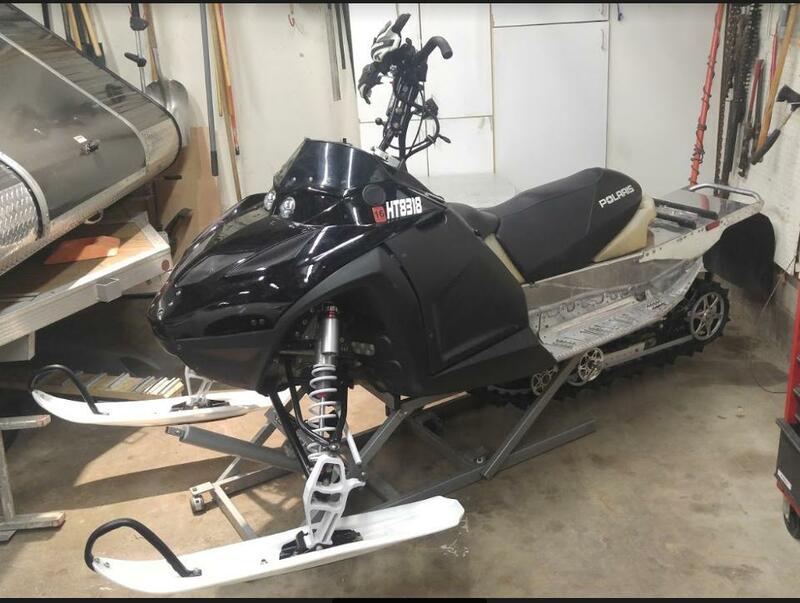 Fighting for warranty coverage, but grabbing another sled tomorrow. Here's to having 3 in the garage! Will delay my 700xx purchase, but hopefully only a few weeks.